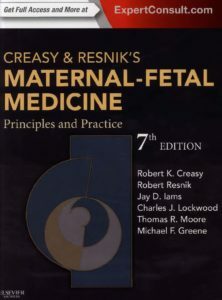 Minimize complications with Creasy and Resnik’s Maternal-Fetal Medicine. This medical reference book puts the most recent advances in basic science, clinical diagnosis, and management at your fingertips, equipping you with the up-to date evidence-based guidelines and knowledge you need to ensure the best possible outcomes in maternal-fetal medicine. The primary function of the mammary gland is to provide nutrition for the young in the form of milk protein and fat. However, there are other benefits that are provided by lactation, such as the provision of immune factors that are secreted into the milk, which provide protection from infection. 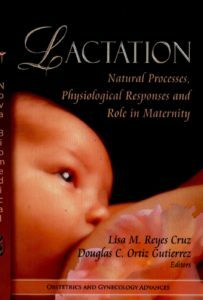 In this book, the authors discuss the natural processes, physiological response and role in maternity of lactation. Topics include gene expression in the mammary gland; human milk oligosaccharides and their health effects; the role of micro-RNAs in the lactation process; hormonal control of lactation, the role of breastfeeding in lactation; and Wnt signaling and ultrasound in lactation. 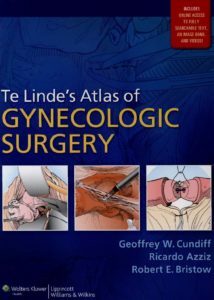 As the field of gynecologic surgery evolves at a rapid pace, stay ahead of the crowd with Te Linde’s Atlas of Gynecologic Surgery, your foremost guide to pelvic anatomy and surgical technologies. Perfect for both gynecologists-in-training and veteran physicians, this tome of information imparts the latest novel techniques that will keep your practice on the industry’s cutting edge. Whether you’re just getting started, looking to hone your surgical techniques, or simply searching for an outstanding guide to keep your memory fresh — this text will help you gain mastery of the latest developments in gynecologic surgery. 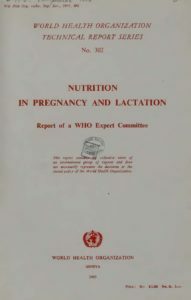 This report contains the collective views of an international group of experts and does not necessarily represent the decisions or the stated policy of the World Health Organization. This is the 3rd edition of a classic text which still represents the only multi-disciplinary approach to the evaluation and management of a high-risk pregnancy. Since most chapters are written by a 2-author team (an anesthesiologist and an obstetrician or fetologist), information will be efficiently formated, practical, and complete. Coverage will include causes of the health risk, pathophysiology, obstetric treatment written by an obstetrician, and anesthetic management written by an obstetric anesthesiologist. Chapters will include the latest procedures and most advanced technology. They will cover the parameters used to observe fetal well-being and deal with abnormal findings, regardless of the stage of development. Topics will extend through the delivery and post delivery periods. 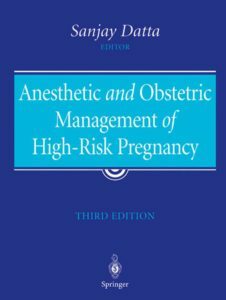 As the field of obstetric anesthesia continues to change rapidly, both in technique and in specific pharmaceutical agents used, it is essential for all practitioners caring for the pregnant patient to be familiar with current anesthetic protocols and general concepts in obstetric anesthesia. The Handbook appeals to a wide audience, as it was written with the practicing anesthesiologists in mind, as well as nurse anesthetists, obstetricians, housestaff, and residents. 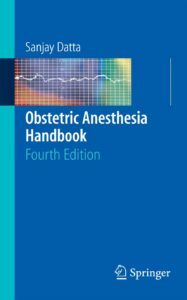 The Obstetric Anesthesia Handbook supplies expert advice on every facet of anesthesia for childbirth and related obstetric procedures. The text is authoritative, succinct, and highly practical. It is accompanied by over 100 illustrations and tables making the text a convenient reference to the busy practitioner. The Handbook is also a natural companion to the recently published, Anesthetic and Obstetric Management of High-Risk Pregnancy, also by Dr. Datta. 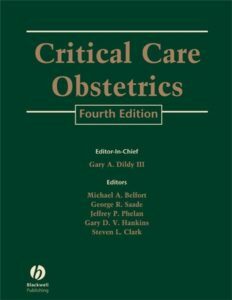 The fourth edition of Critical Care Obstetrics has been extensively revised to reflect the advances that have been made in maternal-fetal medicine. This edition contains 14 brand new chapters written by the field’s leading physicians. Critical Care Obstetrics, 4/e, offers expanded coverage in areas vital to intensive care management, including Neonatal Resuscitation, The Organ Transplant Obstetrical Patient, and Ethical Considerations. This practical guide and reference will be of invaluable assistance to obstetricians, and primary care physicians, in both the treatment and referral of high-risk patients. Complications that arise during childbirth remain a significant challenge for all healthcare providers. 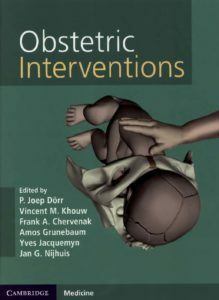 Obstetric Interventions is a richly detailed text that combines traditional obstetrics with the use of innovative birthing techniques. With clear, state-of-the-art color illustrations throughout — all originally produced for this text — this book gives clear insight into the mechanisms of normal childbirth and the alternative techniques of obstetric intervention that may need to be used in the delivery room. 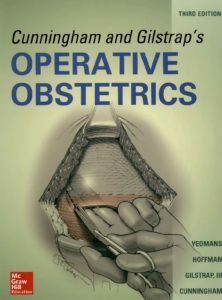 In addition to being highly illustrated, the book is accompanied by over fifty animated simulations of obstetric interventions that are available online. These highlight the different birth mechanisms in truly unique detail and will aid understanding of anatomy and technique. Obstetric Interventions is aimed at obstetricians, obstetric trainees, and midwives. This book provides an evidence-based insight into the choices that obstetricians and midwives face every day at all stages of the birthing process. THE guide to women’s reproductive health. The knowledge needed for careful and effective practice of obstetrics & gynaecology continues to grow. 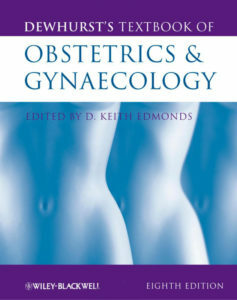 Dewhurst’s Textbook of Obstetrics & Gynaecology distils evidence and experience into a straightforward, practice-based guide to women’s reproductive health. This 8th edition has been comprehensively updated to reflect modern clinical needs. Summary boxes throughout enable rapid assimilation of key information for effective clinical practice. The two main parts, obstetrics and gynaecology, have been further divided into thematic sections: The basics of obstetrics and of gynaecology, The phases of pregnancy from preconception to postnatal care, Maternal medicine and fetal medicine, Menstruation, Infertility, Urogynaecology, Gynaecologic oncology. Designed for trainees and to support experienced practitioners, Dewhurst’s Textbook of Obstetrics & Gynaecology is your ideal clinical companion. The benchmark text on obstetrical procedures updated and expanded to reflect current practice.